Although there are no Employer Incentives, hiring young people has its merits. Here are 5 benefits of hiring young people. 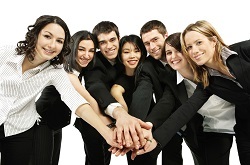 Young employees can bring fresh perspective and a different way of thinking to your business. Most young workers are eager to learn, build their experience and apply their skills in the workforce. This enthusiasm is great for team building, productivity and workplace moral. Younger employees will also give you an advantage if you want to target the millennial market as they understand how to reach and communicate with their peers. Young people are used to learning. If they have just come out of school or postsecondary education they will still retain a mindset that will help them absorb training more readily. As they don’t have a huge amount of previous experience young people are essentially a ‘blank slate.’ This affords their employer an opportunity to develop a workforce of young people specifically trained to meet their organisation’s needs. More often than not, wages for a young employee are less expensive than those for an older more experienced worker. There are also options for formal trainee and apprenticeships which can be of great benefit to both employers and young people. Millennials have grown up around technology. Their natural affinity for tech and their ability to apply and understand different technologies quickly sets them apart from other generations in the workforce. Hiring young people has a positive and important impact in driving business forward in the adoption and use of new software and technology. When unexpected circumstances arise, younger people are better equipped to respond to sudden change. – Concordia Study Montreal, January 18, 2011. This can be of great benefit in the shifting landscape of the modern day workplaces where process, technology and priorities are constantly changing. With economic, social and political boundaries in a state of flux, adaptability gives young people an advantage in a work environment that is more agile, changeable and fast paced than ever before. Sheridan Community Employment Services works closely with local employers to understand their organisations needs and partner them with their ideal young candidate. Contact either our Oakville or Brampton Community Resource Centre and we would be happy to assist you.